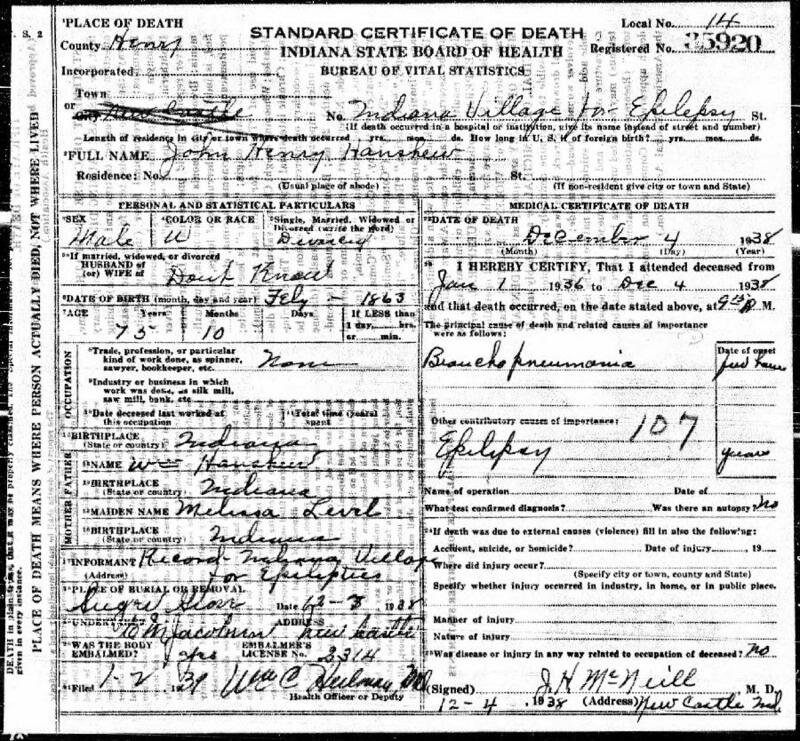 Hanshew, John, boarder, age 37, born Feb 1863 in Indiana; parents born in Indiana; divorced; occupation: farm hand. Hanshew, John H., head-of-household, age 47, born in Indiana; parents born in Indiana; second marriage, married 8 years; occupation: farmer, general farm; owned farm (free). Hanshew, Martha E., wife, age 48, born in Indiana; parents born in Indiana; first marriage, married 8 years; no children. Word has been received here of the death of Mrs. Ella Hanshew, age 56, at her home west of Anderson last evening at 8 o'clock, after six weeks' illness from apoplexy. Mrs. Hanshew was the daughter of John and Mary Crandall and was born and reared in Henry county. Besides her husband, she is survived by five brothers and three sisters. They are Mrs. Laura Harter, north of Newcastle; Mrs. Louisa Trout, west of Newcastle; Mrs. Hettie Strong, of this city; James Crandall, of Kansas; Albert Crandall, north of Springport; Charles Crandall, of Millville; Ed Crandall, west of town, and Wyatt Crandall, north of Newcastle. The funeral will be held at the Sugar Grove church Saturday afternoon and interment will also take place there. Hanshew, John H, boarder, age 56, born in Indiana; parents born in Indiana; widower; occupation: none. 1870 census, Noblesville P.O., White River Township, Hamilton County, Indiana; roll M593-319, page 267, line #28, dwelling #359, family #365. 1900 census, Stony Creek Township, Madison County, Indiana; roll T623-386, ED 112, page 6B, line #87, dwelling #122, family #124. 1910 census, Jackson Township, Madison County, Indiana; roll T624-364, ED 105, page 2B, line #56, dwelling #34, family #34. 1920 census, Jackson Township, Madison County, Indiana; roll T625-449, ED 118, page 7A, line #15, dwelling #162, family #165.